This deal is a very hot seller. Groupon has already sold over 525+ vouchers at the time of this post. Promotional value expires 120 days after purchase. Amount paid never expires. Nighttime options redeemable Sunday-Thursday from 9 p.m.-12 a.m. only. Reservation required. Limit 1 per person, may buy 1 additional as gift(s). May be repurchased every 90 days. Valid only for option purchased. Merchant is solely responsible to purchasers for the care and quality of the advertised goods and services. 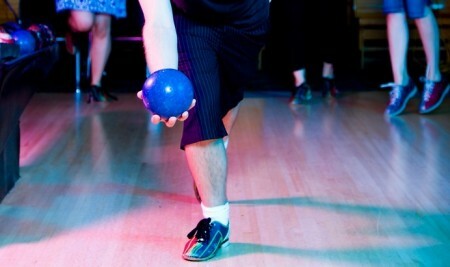 Knowing how to read a bowling lane will help your score more than knowing how to read the snack-bar menu. Read on to decipher the lane’s mysterious markings. The dots and arrows on a bowling lane aren’t just there for decoration; they’re there to help you aim consistently. Each lane consists of 39 inch-wide boards that stretch vertically from the beginning of the approach (the area behind the foul line) to the pin deck. A series of dots printed on the approach divides these 39 boards into intervals of 5, the center dot corresponding exactly to the center of the lane. Using these dots, a bowler can discover (through trial and error) their favorite starting position for every shot, leading to a consistent delivery. The dots can also help make any necessary adjustments when facing a spare; moving just six boards can mean the difference between hitting the center pin and the four pin to the left of it, nearly 2 feet away. Printed 15 feet from the foul line, the arrows serve as easier targets than the pins themselves. Since the V formation lines up perfectly with the first row of pins, rolling a ball straight across the center arrow will knock down the center pin. Of course, bowlers who have learned to spin the ball usually adjust their target to hit the “pocket” just to the right or left of the center pin—increasing the chances of a strike. The most common target arrow for right-handed bowlers is the second arrow from the right, though only practice can determine which target leads to consistent scores for any given bowler. © 2019 Winnipeg Deals Blog. All Rights Reserved.